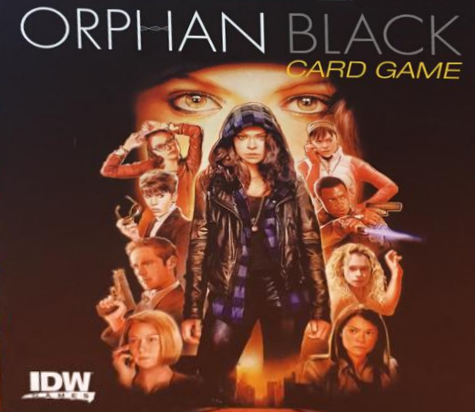 Orphan Black: The Card Game in the News! We’re excited to see our newest game, Orphan Black: The Card Game is getting noticed out in the world. First up we have an interview by David Lowry of Club Fantasci doing a video interview of Sen and Jay (though Jay’s camera wasn’t working!). Then we have a written article in the Fanshawe newspaper (where Sen is a professor) about how Orphan Black came to be! We’re hoping to see more reviews pop up soon as well. Let us know if you’ve played it and what your thoughts are on the game. Orphan Black from IDW Games – this one just came out! It’s our first released game based on a license (but not the last for this year!). A social deduction game based on the cult TV show. Junk Art from Pretzel Games – so excited for this! It’s the second game in the Pretzel line of games (where the first one was the immediately likeable game, Flick Em Up). This one is a block balancing game that has tons of variety in it! Godzilla from Toy Vault – another license! This one is a card game for 2 players with each player playing as a kaiju trying to defeat the other one. Godfather from IDW Games – there’s a Godfather game from IDW coming out very soon that’s not by us – but the next one is! The subtitle is A New Don, and it’s a dice rolling and area majority game. I really like it and it really feels like a new take on both mechanics. Powers from IDW Games – this one is based on the Brian Michael Bendis comic about a detective agency solving crimes committed by people who have super powers. The game is like a beefed up version of Scotland Yard where one player plays the villain and the rest are the detectives trying to catch him. Pop Goes the Weasel / Monkey Mania from R&R Games – not sure what the final title will be for this game yet. It’s a family game about chasing monkeys around a tree, trying to get more bananas while avoiding the weasel! Happy to have designed a game that is more of a family game! Top Secret game by Top Secret publisher – not announced yet – a city building game! We love tile laying games!! This one has very low down time. Rock, Paper, Wizards by Gamelyn Games (co-designed by Josh Cappel) – a social game about making hand gestures and attacking the other players. Clunatics by Breaking Games – This is a cool party game that involves giving players super tiny clues that, by themselves mean nothing, but when combined with a few of these mini-clues, will hopefully get people to guess the answer! Untitled game by Top Secret publisher – not announced yet – but a party game that requires the use of an app. It’s pretty clever, if I do say so myself! Top Secret game by Top Secret publisher – not announced yet – but it’s a quick reaction zombie game that can be used with an app – or without. I like that the game has an arc/story to it even though it’s a quick reaction game! 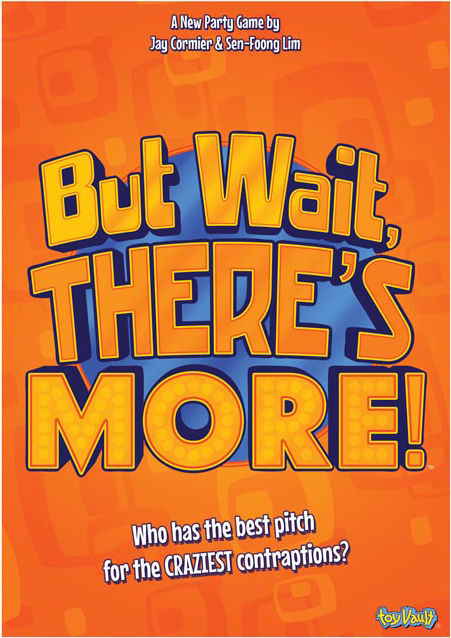 Top Secret game by Top Secret publisher – not announced – not even signed yet – just verbally…a quick reaction animal game that’s great for the entire family – but also scales in difficulty if just adults want to play. To top it all off, we’re working with a couple of comic book creators on some games based on their comics! I’m super excited about these three projects because I’m a fan of each of them! Dice Tower recommends But Wait There’s More…again! You can listen to the entire podcast here, or jump to 15:45 to hear his comments about But Wait There’s More! Thanks Eric! Orphan Black game finally arrives! Sen and I were asked awhile ago if we could make a social deduction game based on the Orphan Black license by IDW Games. We were honoured to be asked to do so as we were both fans of the show. The first few versions of the game just didn’t work. For the longest time we just kind of thought that a social deduction game that involves clones should be about the players trying to figure out which clone is which. This allowed players to play the part of one of the clones, which we also thought was important. After about 9 or 10 alpha prototypes (alpha meaning starting almost from scratch and changing the game enough that it’s entirely a different game), we realized that it wasn’t working. We also realized that the show isn’t about clones trying to figure out who’s who…at all! Once in awhile one clone will get dressed up as another clone – but that’s about it! So we changed gears and figured out that the game had to be about control of the clones. In the show there are 3 factions that want control (or freedom) of the clones: The Black (they just want freedom), Neolutionist (they want to control clones) and Proletheans (they want to kill clones) – over-simplifying, but it worked as a foundation for our design. So now we have players playing as one of these factions, and trying to coerce the clones to come to their faction – but trying to do it without others knowing which faction you were in! Now THIS is feeling more like an Orphan Black episode!! We got through the alpha phase and made our way through the beta phase, tweaking and balancing various abilities and rules. We were even able to add in many of the non-clone characters into the game as well. So fans of the show will be able to play with Fee, Delphine, Paul and more. So now the game is out! We’re seeing stores post online that it’s in stock all over the place – and that’s exciting! We’re looking forward to our first game based on an license to be played by fans of the license! Please let us know your thoughts – or let us know where you’ve seen the game for sale!! I’ve seen it in my local game store here in Vancouver – at Magic Stronghold. I saw The Uncommons in NYC post that they just got it in stock. It should be popping up everywhere! To tide you over, you can listen to the CloneCast podcast where they play the game with some stars from the show! Pretty cool – too bad it’s only audio! !